Nancy fosters desire for Catholic education among Latino families throughout the Archdiocese. 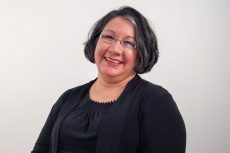 She collaborates with AOPS and parish staff to establish better communication with the Latino community, and aims to increase school enrollment and parish celebration involvement. Spanish Consultant for the education publishing company, William H. Sadlier Inc.
Nancy’s dog Char-Les is trained as a therapy animal. In her free time, Nancy takes Char-Les to visit the elderly at nursing homes and children in various school and library reading programs in the area.